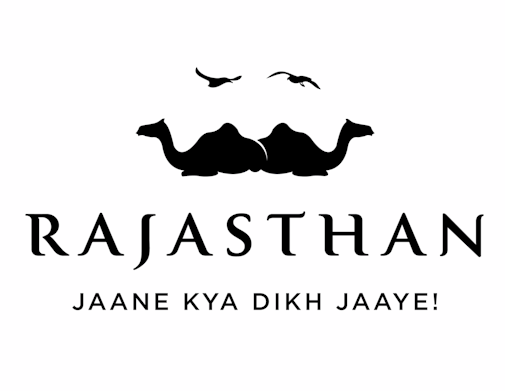 Fly Like a Bird - Paragliding in Rajasthan. Important Info: If you opt for Gopro Action Video & Pics, Please carry 16GB Micro SD (HC I or XC I or U1 or U3 Rating). Infight GoPro video & Pics are chargeable extra. 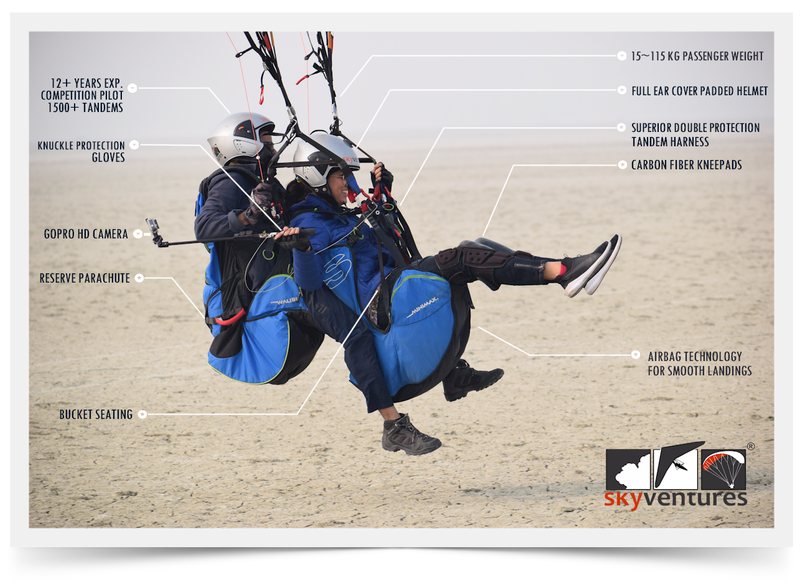 Fly Like a Bird without any previous experience of flying under the expert control of one of the most experienced paragliding pilot. Passenger sits in the front, 360° Bird like view. Feel the wind on your face, the sky above your glider, ground below your feet and flying with confidence. 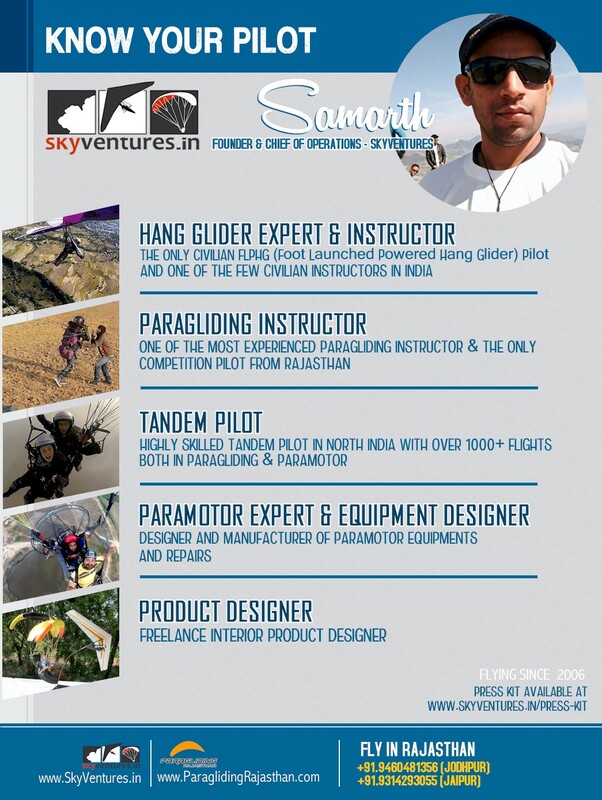 The unique experience of Paragliding is much more live than flying in helicopter or aeroplane. We have the most advanced equipment for safe flying. Easy, relaxed cruising in air. 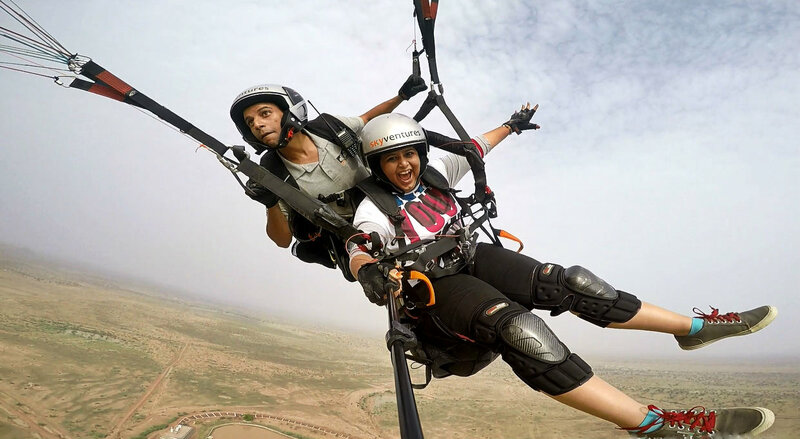 Tandem paragliding is the easiest way to taste the thrill and fun of free flight. Just sit with the pilot on a separate and comfortable seat and enjoy the fun. It is as easy as flying in a chair. Fly with Confidence. Smooth & full of Adventure. No one is too young or old. We have experience of flying from 6 years to 84 years olds and 20 Kg weight to 115 Kg.Very smooth flying, no fear feeling. A perfect gift to you and your loved ones. A life time experience. A perfect gift for yourself and your loved ones.We also have most advanced GoPro action cam that can be hired on nominal charges on per flight basis to capture everlasting memory of your Joy Ride. Kindly note that this is a weather dependent activity and thus we are able to fly a very limited number of persons each day. Confirm us by WhatsApp/phone so we can treat your booking as confirmed. 100% refund of advance booking amount if flight gets canceled by SkyVentures due to unfavorable weather or any unforeseen reason. Non-refundable if cancelled by customer but the same can be adjusted for future booking on mutual agreement.